For football fans nationwide, the bowl games are long-awaited treats at the end of the gridiron season. Two of the bowl games are now reserved for the top four teams, and the winners of those games will go on to play for the national championship. One of the more prestigious bowl games annually is the Sugar Bowl which is always played in New Orleans on or after January 1. For many years prior to opening the massive Superdome in 1975, the Sugar Bowl was played in Tulane Stadium which was the home field for Tulane University and the New Orleans Saints. The Saints began their initial season in 1967, and now both teams have played their home games in the Superdome following its’ opening. Cathy and I called New Orleans our home for the four years I was receiving my surgical training at Charity Hospital. Initially we had an apartment in the new Bissonet Plaza Apartments in Kenner which was a 15 minute drive from the hospital. Cathy taught 5th grade for one year in John Clancy Elementary School in Kenner. Her second year of teaching was in Jefferson Parish on the West Bank, so we moved into a new duplex apartment on Pace Boulevard in Algiers which was close to her school. It was only a 10 minute drive for me across the Mississippi River Bridge to Charity Hospital. We loved living in the duplex because we had some wonderful neighbors with whom we became close friends, and we even had a small yard. In addition our neighbors were able to offer Cathy some peace and protection during the long hours and frequent nights I had to spend at the hospital taking call and doing emergency surgical procedures. The couple in the adjacent duplex were Bob and Jerri Herold who had moved from St. Louis. They were close in age to Cathy and me and had 3 young children. We bonded quickly with them, and Jerri became like an older sister to Cathy. An older couple, John and Jean Boyd who were in their 60’s and had retired from upstate New York, lived two doors from us and were like surrogate parents. They were particularly helpful following the birth of our son John, and it was nice to have a couple with so much life experience living near-by. I especially loved John because he was quite the story-teller and we swapped many tales, most of which were true. The Christmas holidays of 1966 were uneventful for us. I had recovered from serum hepatitis which I had contracted in the early spring at Charity Hospital, probably from an inadvertent needle stick. Cathy was in the first trimester of her pregnancy with our first child, and we had spent our holidays there in New Orleans. The Sugar Bowl of 1967 was being played between Alabama and Nebraska in Tulane Stadium on January 2, and I had no plans for attending the game. Occasionally a few doctors at Charity Hospital could get complimentary tickets for games played in Tulane Stadium, but I didn’t even try that year because I wasn’t interested in either team. Although Alabama was undefeated at 10-0, they represented the Southeastern Conference, and in those days the Razorbacks were in the Southwestern Conference, so I was indifferent toward the game. On the morning of January 2 I did not have to report to the hospital, so I was enjoying a day of relaxation and had plans to watch a few of the bowl games on television. It was about 9 AM and the weather was clear with a little chill, but not enough to warrant any more than a light jacket. I happened to look out our front window and noticed a man standing on the sidewalk of our front yard with his back toward me. Although I considered our neighborhood safe, it was very unusual to have a stranger standing in the front viewing the apartments across the street. The distinctive thing about this large man was the hat he was wearing; a black and white hounds-tooth. That made him look familiar but I couldn’t tell for sure, so I walked up to him. I introduced myself and told him we were living in New Orleans while I was completing my surgical training. I further said I was born and raised in El Dorado, and very familiar he was raised in Fordyce, Arkansas which is about 50 miles north of El Dorado. I knew that would encourage conversation about his earlier life, and we talked for about 10 minutes about his life and experiences in South Arkansas. He asked a few questions about our life in New Orleans, and whether we eventually planned to go back to live in Arkansas. I made sure he knew I was a loyal Razorback fan, and he commented something like this; “They are a good team and well coached by Frank Broyles.” Then he said he needed to go and convince his wife the team and coaches were expecting him at Tulane Stadium by 10:30 at the latest. We shook hands and I told him it was a pleasure to have this brief visit with him. 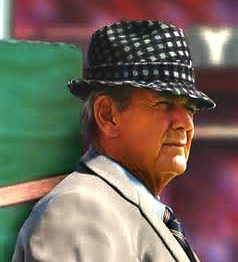 As he left the thought came to me how many loyal Crimson Tide fans would have paid large sums of money into the Alabama Athletic Foundation to have just a couple of minutes to chat alone with the famous Coach Bear Bryant! And I had the pleasure at no cost and now the privilege of telling the story nearly 50 years later. That’s one example of an undeserved gift which is grace. PS: Alabama soundly defeated Nebraska that day by a score of 34-7 and remained undefeated at 11-0, but still was not voted the National Champion. Notre Dame received that honor with a record of 10-0-1. No surprise that you found him to be a nice guy, beyond the celebrity status. With your time in New Orleans, you should appreciate this story. We hunted at Keystone Deer Camp north of the Ouachita River. One year, Dad invited some of his friends from Morgan City up to hunt. On the way to the deer camp, one of the guys spoke up. “Fordachay, I’ve always wondered where that town was. One of my truck drivers always talks about stopping at Fordachay.” Dad quickly translated from Cajun to English and realized his friend was pronouncing Fordyce Acadiana style. “Fordachay” was always a good stopping place to rest between El Dorado and Little Rock. I’m sure you remember the Redbug Cafe in downtown Fordyce. When that closed, there was a restaurant on the highway that we would frequent called The 4 Dice Restaurant. They had great home cooking! Then for the last 8-10 years we were in El Dorado, we regularly stopped and had a meal and got sweet rolls, etc. in the Klappenbach bakery downtown. It seemed our car automatically made that right turn to go downtown.